All orders will be shipped within 24-48 hours of payment. It is recommended to order minimum of 2.5 Kgs to maximize shipping costs. All orders are directly shipped from India, and will be delivered based on the shipping details as shared by you in the Order. All orders will be delivered in 2-3 business days (EXPRESS DELIVERY) upon payment and also subject to the product availability as requested. 5. Certain sweets and savories may be susceptible to light crushing due to shipping and handling which we do not have any control. 1. For International buyers, orders are shipped and delivered through registered international courier companies. 2. www.Mylaibazar.com is not liable for any delay in delivery by the courier company / postal authorities and only guarantees to hand over the consignment to the courier company or postal authorities with in(Maximum and based on the delivery schedule) 2 working days from the date of the order and payment or as per the delivery date agreed at the time of order confirmation. 1. All transactions are safe and secure. 6. Payment return is not supported once Orders are placed, we do not support cancellation policy. WHY IS THE SHIPPING COST MORE THAN Average ITEM PRICE? 1. Shipping is bundled for minimum 3 kilograms minimum (i.e. Orders 0 to 3 kilos will be charged same, We request our valuable clients to maximize the opportunity as per their need. 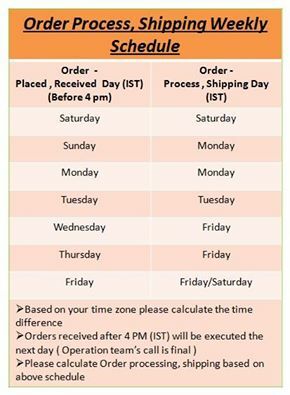 As the package is arriving fresh from India, we request our clients to utilize the opportunity to the best, also please note shipping charges come down if the over all shipping weight increases. 6. The products are shipped in Express delivery mode. 7. For any shipping related information please call us on +91-9840386615.